Back in the day, the first weekend of NFL football wasn't something most fans got all worked up about. And we were skeptical ourselves when the NFL came up with the "Opening Kickoff" pseudo-event a few years back. Then came Sept. 8, 2002 -- not just a great opening Sunday, but one of the greatest regular season days in NFL history. It's hard to argue that this opening day matchup between the Rams and the New York Yanks was highly anticipated  the New York Times didn't bother to send a reporter out to L.A. to cover the Friday night game, and only 30,315 fans came to the Coliseum to see the 54-14 romp. But it was a great day for the Rams backup QB, Norm Van Brocklin, who started instead of the injured Bob Waterfield and passed for an NFL record 554 yards, throwing four TD passes to Elroy "Crazylegs" Hirsch and another to Vitamin T. Smith. Van Brocklin also plunged in from the one-foot-line for a rushing TD. Other records set by the Rams that day: 735 total yards and 34 first downs. Vick may have busted out, but Favre was Favre -- and that's more than anyone can handle. With 1:10 left in the Packers-Falcons opener, Green Bay fullback William Henderson managed to edge into the end zone -- barely -- on fourth and inches to put the Pack ahead, 34-31. But Michael Vick led the Falcons back downfield and, with five seconds left, Jay Feely's 52-yard field goal knotted the game at 34. With the temp hovering above 90 degrees, the game went into OT. Packers kicker Ryan Longwell finally broke the deadlock with a 34-yard field goal 9 minutes and 45 seconds into the extra period. On the day, Ahman Green ran 27 times for 155 yards. 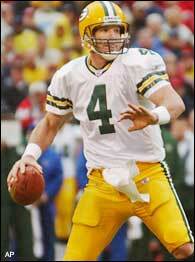 Brett Favre connected on 25-of-36 pass attempts for 284 yards and two TDs. Vick was 15-of-23 for 209 yards and one TD, and he also rushed for 72 yards and a TD on nine carries. Tennessee vs. Oakland in Memphis. The Titans first game in their new home state. And Eddie George was ready. The 1996 Offensive Rookie of the Year put on one of the gutsiest fourth-quarter running performances ever, rushing for 63 yards on nine carries as the Titans drove 91 yards to tie the game late in the fourth quarter. Among his runs: a 29-yarder for a TD that gave the Titans a 19-14 lead over the Raiders. Exclamation point: George then added a two-point conversion to put Tennessee up 21-14. Oakland tied it to send the game into OT, but Al Del Greco nailed a 33-yard field goal midway through the extra period for the win. George's 216 yards on 35 carries was the second-highest rushing total in an NFL opener. Tarkenton, a rookie QB, came off the bench for the expansion Vikings and smoked Chicago, finishing the day 17 of 23 for 250 yards and four TD passes, with one TD on the ground. Minnesota would go on to have a lousy year, and the Bears a good one; but the 37-13 upset at Metropolitan Stadium ranks as one of the most spectacular, and unexpected, rookie debuts. O.J. Simpson ran 29 times for 250 yards and scored TDs on runs of 80 and 22 yards. In the Bills 31-13 win over the Patriots in Foxboro, Simpson broke Willie Ellison's single-game rushing record (247 yards, set in 1971). He credited his offensive line, and said, "The guys have been telling me they are going to get me 1,700 yards this season. They certainly went out and played like they meant it." Chicago Cardinals QB Jim Hardy, a former USC star in his fifth NFL season, had one of the worst games imaginable in this contest against the Eagles, the defending league champs. He threw eight interceptions (three to Joe Sutton and four to Russ Craft) and fumbled twice as the Cards got crushed, 45-7. Hardy finished the day 12-39, connecting on almost 50 percent of his passes -- if you count the INTs. In all, three of Hardy's misfires and both of his fumbles led to TDs. The Associated Press, wanting to be certain everyone understood, began its game recap by saying flat out that the Cards were "bewildered and inept." Fortunately for Hardy, there would be better days. In 1950, he was selected for the Pro Bowl, the only time in his seven-year career he received the honor. Buffalo was once again reduced to a drinking town with a football problem. It was 112 degrees on the field in Buffalo, RB Curtis Martin was out with a sprained ankle, and the Jets, who played sloppily all day long, didn't seem to have a chance in their opener against the Bills. But they had Chad Morton. He returned two kickoffs for TDs. In the second quarter, he notched a 98-yarder immediately after a Bills score had made it 10-0. Then Bills QB Drew Bledsoe connected with Eric Moulds on a 29-yard TD pass with 26 ticks left in regulation to tie the game. Time to celebrate? Not much. 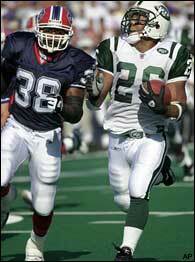 On the first touch in OT, Morton stunned the Bills by scampering 96 yards to give the Jets a 37-31 win after only 14 seconds had elapsed in the extra period. Only four times before Morton had a single player returned two kicks for TDs in a single game, and no player had ever returned one in regulation and another in OT. What a sweet victory. The 'Boys had been trash-talking and dissing their new Texas counterparts, and had to eat their words. Rookie QB David Carr led the Texans to an early 10-0 lead over the Cowboys, then tossed a 65-yard TD pass to Corey Bradford in the fourth quarter to put the Texans up for good. Ahead 17-10, the Texans decided to rub it in, as Seth Payne sacked Cowboys QB Quincy Carter in the end zone for a safety with less than three minutes remaining. The Reliant stadium crowd of 69,604, which had been extraordinarily loud throughout the nationally-televised matchup on ESPN, went nuts. The Texans became only the second team in NFL history to win its opener. Dan Marino: 32 years old and coming back from a ruptured Achilles tendon. Drew Bledsoe: 22 years old and ready to proclaim himself the leader of the new generation of QBs. What a matchup. The slingers exchanged nine TD passes (five for Marino, four for Bledsoe) in a wham-bam shootout decided when Marino hit Irving Fryar for a 35-yard TD on fourth-and-five with 3:19 left. Marino finished the day 23-for-42 for 473 yards. Bledsoe completed 32-of-51 for 421 yards. Final score: Dolphins 39, Pats 35. The Browns led the Chiefs, 39-37, with no time left on the clock. And they lost. Say what? In a bizarre capper to a bizarre game, Browns linebacker Dwayne Rudd thought he'd sacked KC QB Trent Green, who had dropped back to attempt a Hail Mary. But before Green hit the ground, he managed to lateral to 320-pound right tackle John Tait, who ran 28 yards down to the Browns' 25-yard line, in what seemed to be a meaningless jaunt. But Rudd celebrated a little too early. With Tait still lumbering, he took off his helmet and threw it 10 yards. The refs nailed him for unsportsmanlike conduct, which gave the Chiefs one more play. Morten Andersen then kicked a 30-yard field goal to give the Chiefs a 40-39 win. But wait -- there's more. The Chiefs comeback was pretty spectacular before that last play. They scored 24 points in the fourth quarter to overcome a 17-point deficit. The comeback included three TDs by Priest Holmes, who rushed for 76 yards on six carries in the quarter and finished the game with 122 yards and 4 TDs. Browns QB Kelly Holcomb had a great game, going 27-of-39 for 326 yards and 3 TDs. Browns kicker Phil Dawson hit four field goals, coolly nailing the apparent game-winner from 41 yards out with only 29 seconds left. In all, the lead changed nine times and the combination of performances and mishaps (I've left out many) made this a savory contest. Unless, of course, you're a Browns fan.